Should the path lead you all the way to the edge of Slovenian Istria by the Italian border, make sure to stop at a small coastal oasis called Ankaran. With its youthful and boisterous atmosphere covered by the shadow of olive and pine trees, Ankaran is sure to impress you. Ankaran's hospitality offers many opportunities to take a breather. Choose yours. Rich foods and an excellent selection of local wine are bound to satisfy even the most demanding gastronomes. 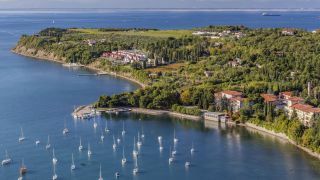 Take a rest in the peaceful location of the largest camper van park in Slovenian Istria, spend your day enjoying what the nearby sports park has to offer, or watch the sunset as you try the local cuisine. Discover the youthful side of coastal tourism. Welcome to Ankaran. What is happening in and around Ankaran?